You set the terms of the trade credit and the rate you are willing to pay. Your loan will be listed on our marketplace auction site. Investors will make competitive bids in an auction to invest. After the auction ends, settlement occurs in 1 hour. This particular model of finance optimises cash flow through allowing businesses to lengthen their payment terms to their suppliers. Supply chain finance is particularly suited to businesses that have complex or large supply chains such as automotive, manufacturing or retail. For this model to operate better, the buyer is recommended to have a better credit rating than the seller as they can access capital at a lower cost. However, this is not necessary. Invoice finance allows businesses to increase and improve their cash. This finance will allow a business to employ more staff, stay up-to-date with a supply chain or operating expenses. Marketlend understand that small businesses fluctuate in business activity, especially during the establishment and growth period of their business cycle. 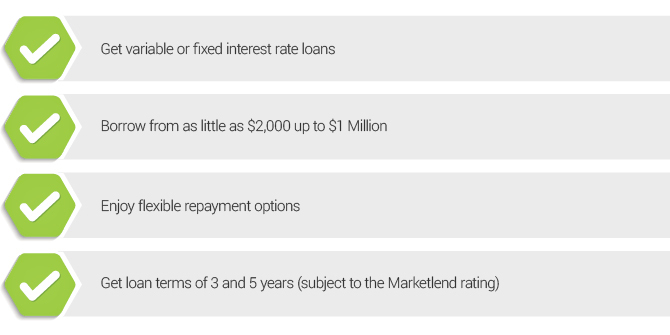 Because of this Marketlend provides flexible peer-to-peer financing solutions for your business. This type of finance is low cost and requires no real estate security. You will be able to access direct funding and easy access to statements. Need new assets for your business? Asset finance is the perfect credit loan for you and your business. This loan increases your cash flow and alleviates any financial worries you may face by providing the cashflow needed to access the resources you required for optimal business growth. Industries that require continual growth and innovation such as automotive, manufacturing and retail can particularly benefit from this, ensuring that your business is never left technologically behind. Debtor finance is a type of credit loan that is calculated based on a business’ accounts receivable. The accounts receivable is a legal claim for payment from the business to its customer, which can be leveraged to secure a line of credit. This is because it is viewed as an asset to the business. Any business can benefit from debtor finance to fulfil demand for output levels, stay up-to-date with operating expenses, or to take advantage of acquisition opportunities.